Altitude: 2000-3200 metres above sea level. Habitat and Ecology: The species occurs in pre-Puna and on rocky lands within shrubby vegetation in seasonally dry inter-Andean valleys. In Cacti the Illustrated Dictionary by Rod and Ken Preston-Mafham they write that this form occurs "in an unusual habitat for a Lobivia on flat alluvial land where farming and building have rendered this beautiful variety virtually extinct." 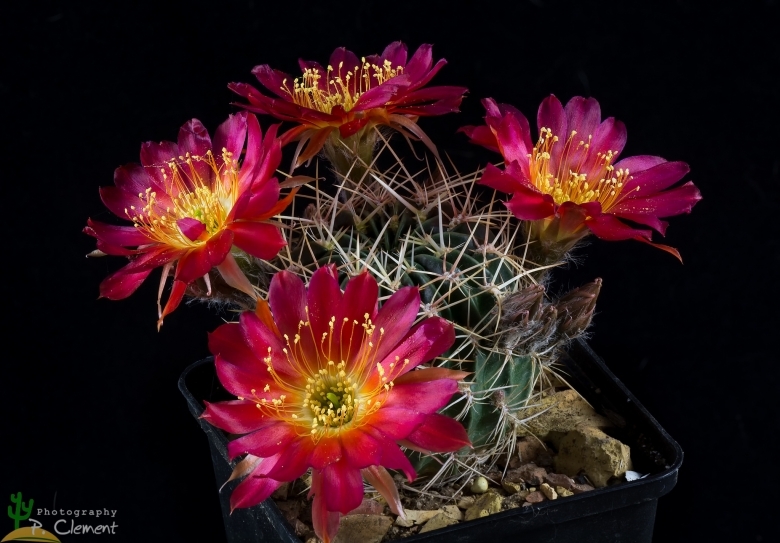 Description: Lobivia acanthoplegma var. patula is one of the many geographical or morphological form of Echinopsis cinnabarina. Many variant of Echinopsis cinnabarina was early classified as different independent species, but nowadays all this plants are considered part of a multiform species, where each form is linked to others by populations of plants with intermediate characteristics. This variety has more porrect-spreading spines than the similar Echinopsis cinnabarina var. acanthoplegma, this different spination is probably due to the lower altitude of Cliza, and the patula must be included in to the type. This plant puts out a few flowers at a time continuously for several weeks in spring to early summer. Stem: Spherical-flattened to spherical, 15 cm diameter. Ribs: Aprrox. 26 with noticeable tubercles up to 15 mm long. Radial spines: Approx. 10, up to 20 mm long, awl-like, more porrect-spreading , more or less interlaced. Flower: Arising from the basal tubercles on the side of the plant, up to 5 cm long and in diameter, unscented, orange to dark violet-red, throat lighter or white. 8) Walter Rausch "Lobivia 85." Rudolf Herzig Verlag, Wien. 1986. 11) Lowry, M. 2013. Echinopsis cinnabarina. In: IUCN 2013. IUCN Red List of Threatened Species. Version 2013.2. <www.iucnredlist.org>. Downloaded on 12 January 2014. Cultivation and Propagation: Lobivia acanthoplegma var. patula is a summer grower species that offers no cultivation difficulties. Water regularly in summer (but do not overwater ) needs good drainage and very porous, keep rather dry in winter. Feed with a high potassium fertilizer in summer. It is quite frost resistant if kept dry (hardy to -12° C). Need a bright exposure, full sun or half shade in summer.